The Dordogne and the neighbouring Lot Valley is one of the most beautiful regions in France, a magnetic holiday destination for food lovers and nature enthusiasts. The area has remained fairly untouched by 20th century development and tourism and the rural way of life continues very much as it has for centuries. Located in the South West of France, the Dordogne and Lot Valleys remain largely underdeveloped and untouched by the 21st century. This beautiful and rural part of France is popular with history enthusiasts for its 1500 castles and pretty walled towns. Visit the medieval towns of Cahors, Conques and Montauban and step back in time at ancient villages such as Domme and Rocamadour. 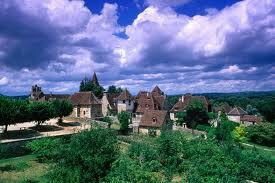 Air France operates direct flights to Dordogne and Lot from the UK. For the best deals on cheap flights around, try our flight search box which compares flight prices from more than 500 travel companies and airlines to find the best value for your money. Popular with tourists particular in Spring & Summer, the Dordogne and Lot Valleys attract visitors from all over the globe who come to relax in this peaceful and rural part of France and to sample wines made in the local vineyards. Head to Sarlat-la-Caneda one of the best restored and most beautiful medieval towns in France with cobbled streets, elegant buildings and a network of lanes and alleyways to discover. 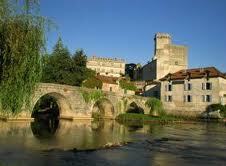 The town of Cahor in the Lot Valley boasts the 14th century Valentre Bridge and the Romanesque Saint-Etienne Cathedral. Don’t miss the stunning cliff-top town of Saint-Cirq Lapopie, famous for incredible views over the Lot river valley, historic manor houses and its 13th Century castle. To find the cheapest flights to Dordogne and Lot, France, we recommend booking in advance and travel outside of the busy holiday seasons if possible. Low cost flights can often be found if you can travel mid-week and Directflights.com can also find you great offers on lastminute flights if you need to make a booking close to departure. Dordogne experiences mild winters and moderate summers, which can be long and very warm at times, making it the best time of year to visit Dordogne and Lot. Average summer daytime highs range from 77F to 95F with occasional storms and showers. Spring and autumn are mild with a higher chance of rain while in late spring heavy rainfall can occur. Winters are generally mild with short periods of cold weather with frequent rain.